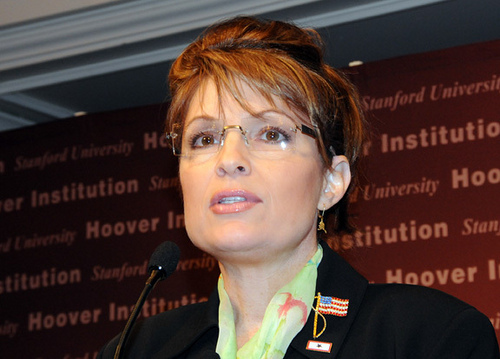 Until now, I’d refrained–purposely–from writing a Fresh Rhetoric column about Sarah Palin. From the moment she first entered the nation’s field of view as John McCain’s 2008 running mate, I’d considered her to be a charismatic fraud–a good-looking, photogenic opportunist with no intellectual foundation, using snark, sarcasm, and divisiveness to peddle the cheapest brand of political demagoguery. Her enduring presence on the national scene owed itself more, in my view, to the fact that certain segments of the media–seduced by her combination of looks and bombast–afforded her far more coverage than either her bona fides or her contributions to society actually merited. While mindful that Fresh Rhetoric was but an ultra-microscopic dot on the media landscape, I’d decided, nevertheless, that this modest vehicle would not contribute to the enlargement of Sarah Palin as a national figure by devoting any screen space to her ridiculous ride on the celebrity train. The Giffords tragedy necessarily changes that. For while many on the extreme right are now working feverishly to distance themselves from this past weekend’s carnage in Tucson, their efforts are a panic-induced, deceitful exercise in instant revisionist spin, and I, for one, will not be so spun. Overly cautious pundits will hem and haw and qualify their assessments in their sound-bite analyses over the next several days, but I won’t: The devastation in Tucson–the six deaths (as of this writing), the 14 injured (as of this writing), the terror, the madness, the chaos, the utter insanity–was the direct and inevitable spawn of the incendiary rhetoric spewed (and media-amplified) by the kooks and crazies on the extreme right, with the mean-spirited, idiotic Sarah Palin as the leader of this lunatic pack. With the Tucson tragedy now standing as testimony to the shortness of the extremist fuse between incitement and action–with Congresswoman Giffords suffering a bullet to the brain not long after Sarah Palin ran an ad using the crosshairs of a gunsight to target Giffords’ congressional district–the time has come for all people of goodwill to declare and renounce the dangerous, ignorant, extremist idiocy of Sarah Palin and her ilk. That ilk, of course, includes others. It includes all the hard-righters who’ve promoted “second amendment remedies” as a path to political change. It includes Giffords’ opponent in the last election, who staged a “Target for Victory” rally at which attendees were invited to shoot a fully automatic M16 rifle with the candidate. But it starts with Palin, as the media’s poster child of thoughtless, cavalier, right-wing lunacy. With the blood of this past weekend still staining the streets of Tucson, the time has come for all of us–the media and the public at large–to renounce and shun this hate-spewing, incendiary opportunist for the dangerous extremist that she is. Go home, Sarah Palin. You’re not cute any more. I have to agree with Harry’s comments on January 10. I have always voted Republican except for this last election. I just couldn’t fathom the possibility that Sarah Palin could ever become the President of the U.S. I’m not totally pleased with Mr. Obama either, but he has advisors who are ever so much brighter than that Cheerleader Sarah Palin. Thank you, Robert. I’m flattered you took the time to read and respond. I hope you’ll continue. This is the first time I have ever not only signed up a word press official, but also blogged a comment ever haha. I just wanted to say that your words are exactly what this country needs. So thank you for being the reasonable voice. I continue to look forward to reading more of your posts. Thank you, Laura, for your very kind words–I’m flattered to know you’ll be reading future posts, and I hope you’ll continue to comment. Insightful, measured commentary Kenn. Thank you. Thank you, CaraLea. Arianna Huffington posted a particularly poignant piece last night. You can read it by clicking here. You do realize that there is not one shred of evidence that this deranged young man was inspired by Sarah Palin, Rush Limbaugh, the Tea Party or anyone else? Your assumption is a stretch based mainly on your political bias. Nobody has to “distance themselves” from him at this point. It is clear from his ramblings online that he suffered some sort of mental illness. I have yet to see one of his ramblings that mentions anyone as his “inspiration.” In fact, if his local congressperson had been a Republican, I suspect there would be a Republican in the hospital fighting for his or her life right now. Loughner seemed to be an equal opportunity hater of government in general and neither left nor right in his beliefs. I don’t think there is a left or a right to deranged. Is there? It appears that if Loughner was inspired by anyone it was some nut case in Milwaukee no sane person has ever heard of. So now you’ve given Palin more bytes than she deserves and you’ve contributed more hateful rhetoric to the fire. But hey, why let facts get in the way of good rhetoric that otherwise fits your world view? Thank you, Harry. I appreciate your taking the time to comment. I second the BRAVO and the gratitude for putting into words what I have been too frustrated, stunned and disappointed in society to verbalize about the ever-growing toxic rhetoric that is becoming our cultural habit and its unfortunate violent side effects. Thank you, Kendra. I’m hopeful we’ll see a shift toward more intelligent, less vitriolic, dialogue, but what a shameful way to get there. Well Said! BRAVO. Thank you very much. No one else has been willing or able to say what you have. Thank you, Theresa. Silence is no longer an acceptable response.